Explores what it means to be undocumented in a legal, social, economic and historical context. 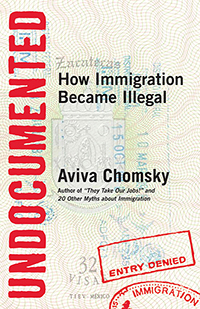 Immigrant rights activist Aviva Chomsky shows how "illegality" and "undocumentedness" are concepts that were created to exclude and exploit. With a focus on US policy, she probes how and why people, especially Mexican and Central Americans, have been assigned this status-and to what ends. Blending history with human drama, Chomsky explores what it means to be undocumented in a legal, social, economic, and historical context. She also unmasks how undocumented people live-how they work, what social services they're eligible for, and how being undocumented affects the lives of children and families. Undocumented turns a fresh lens onto one of today's most pressing debates. What part of “illegal” do you understand?